That’s right--classes for home buyers! If you’re just starting out on your home-purchase process, you may get overwhelmed when you find out all that’s involved. Sadly, it’s not as easy as finding a house, paying for it, then moving in. It’s a great idea to learn all you can about the process as well as being a homeowner. - The Department of Housing and Urban Development has a list of free classes in every state, from credit counseling and home maintenance, to housing for seniors. Click on your state and find all that’s available to you. 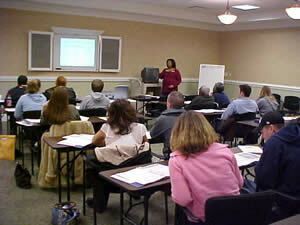 - If you are purchasing your home through FHA, USDA or other agency, you may be required to take the courses. - Before deciding what workshop is best for you, make sure it is certified through HUD, and any credit courses are nonprofit and accredited by the National Foundation for Credit Counseling or the Association of Independent Consumer Credit Counseling Agencies. - Don’t wait until you’ve found a house you want to purchase before signing up! Find a course that will help you learn the ropes from house-hunting to closing so you’ll feel confident when you contact a RealtorⓇ to begin your search. - Credit counseling is best done about six months before you start looking at homes, so you can learn about improving your credit score, as well as creating a budget and sticking to it. You want the highest credit score possible so you can receive pre-approval for a mortgage. - Don’t have enough saved for a 20% down payment? A workshop will help you find a program that will assist you with finding low down payment programs, as well as if there are any grants available in your community. - HUD-approved counseling agencies usually offer one-on-one sessions so you can get a better understanding of your own personal financial situation, as well as answer any specific questions you may have. - Many workshops have more than one “instructor;” you will hear from lenders, appraisers, inspectors, and insurance agents that will discuss their roles in the home-buying process.